A bathroom remodel is one home improvement project that offers a lot of value. Of course, a new and improved bathroom can add value to the home, especially if you’re open to some bathroom renovation DIY projects. But beyond that, this type of project also offers value in that you can design the bathroom you always wanted, make the space more convenient, and take steps to make your bathroom more efficient. Another great thing about a bathroom renovation is that you might be able to save money by doing much of the work yourself. 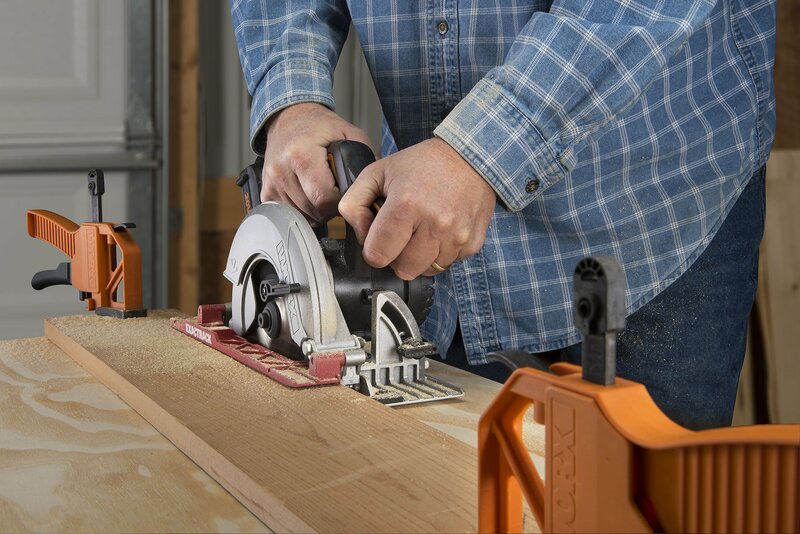 With tools like a 20V Cordless Drill and Driver and the ExacTrack 20V 6-½” Circular Saw, you can do a lot to transform your bathroom. While having the right tools is one part of a successful bathroom renovation DIY project, you also need to do some planning. Here are a few things you should know before starting your DIY bathroom remodel. Make sure to get your measurements right, select the right tiles, make any necessary electrical upgrades, and organize your new space. You don’t want to buy fixtures and other items without being sure they’ll fit in your bathroom. Before you start your DIY bathroom renovation, you need to measure the space you have and consider your plans. How is everything going to fit in the space? Will you have enough room to move around comfortably in the bathroom? Beyond measuring the space for your DIY bathroom remodel, you need to consider things like the clearance for cabinet and closet doors. If your DIY bathroom ideas include a lot of accessories, you are going to want to measure for them and make sure they’ll fit in, too. Most bathroom renovation ideas include installing new floors. If you plan to install new tile in your bathroom, you need to do more than just consider the look. You want to weigh the pros and cons of different materials. Along with that, you also need to think about traction since the floor is likely to get wet. For some homeowners, a bathroom renovation DIY project of installing your own tile floors might be a possibility. However, this could also be a job that requires the skills of a professional. If you do choose to install your own tile floors, the BladeRunner X2 Portable Table Top Saw can be a great tool for when you need to cut tiles. You just need to make sure to get the right blades for the material. It is not uncommon to need some electrical upgrades when you do a DIY bathroom renovation. Older bathrooms only run on 15-amp circuits and there is a chance that the outlets are not GFCI protected. If this is the case, you may need to run a dedicated circuit to the bathroom to upgrade the electricity. While you are at it, you may also want to add some outlets for convenience. If you do choose to add some outlets, an oscillating tool could work well for cutting holes in the sheetrock. In addition to working on the outlets, you may also want to consider some lighting upgrades when coming up with DIY bathroom ideas. Most old bathrooms have poor lighting, so this is a good opportunity to improve visibility in the bathroom. Depending on the design of your DIY bathroom remodel, you could add a light in a few different places. You will definitely want lighting by the sink and vanity. If you build a small toilet room, you will want to add a light there. You could also consider waterproof recess lights for the shower. One of the practical benefits of this project is that there are tons of bathroom renovation ideas that can help you organize the space better. Your sink may already have counter space and a storage cabinet below. If that’s the case, you’ll have at least some storage space already built in. However, if you want to focus your DIY bathroom renovation on increasing storage space, consider adding some shelving around the sink. If you have a linens closet, you could also use this opportunity to redesign the interior to make it more practical and efficient. You could also look into making your bathing area neater when doing your bathroom renovation DIY project. Building recessed shelves into the shower walls can be a good way to keep your shampoo, soap, and other care products organized and out of the way. To make adding a recessed shelf a little easier, measure it to match the size of the tiles used in the shower. If you size it right, you won’t have to make as many tile cuts. Doing so will save you time and effort. A DIY bathroom remodel is a relatively straightforward project, but it still requires time, effort, and skill. If there is any part of the DIY renovation that seems like it might be too difficult or just outside your skill set, consider hiring a professional contractor. It is good to save money by doing some of the work yourself, but you don’t want to take any chances by doing something that is beyond your range. Easily make your DIY bathroom renovation ideas a reality with tools from Worx! Before DIY bathroom remodel, make sure to get your measurements right, select the right tiles, make any necessary electrical upgrades, and organize your new space.